Our broad bean crop was decimated by frost, but I bought some lovely small, fresh broad beans from the market. To me, broad beans and bacon or ham are one of those marriages made in heaven. I had some stock from a roast chicken so risotto seemed an obvious choice to make the most of them. The basic method of making risotto is a doddle; I don’t know why people make so much fuss about it. 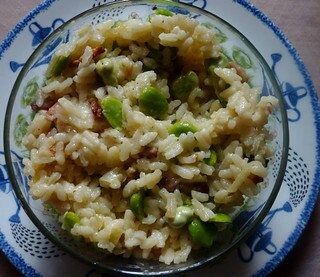 The hardest work in this recipe is preparing the beans, but it’s one of the few recipes where it really is worth blanching and peeling them; pilaff with broad beans and serrano ham is another. Rice is one of the few things I always measure by volume. An ordinary mustard glass holds just the right amount for two people, and for risotto you can count on roughly three times the volume of stock to rice. Don’t bother making risotto with any rice other than Italian; the result won’t be worth the effort. Make pilaff instead. If you like stringy cheese in your risotto, use Gruyère or Comté; otherwise Parmesan, or even aged cheddar. First prepare the beans. Pod them, and then add them to a large pan of boiling salted water and boil for just one minute. Drain in a colander and run cold water over them immediately. Now squeeze each bean out of its greyish outer skin, so you are left with just the brilliant green part inside. Put the stock in a pan, bring it up to a simmer, and keep it warm. Heat the olive oil and a knob of butter in a heavy pan. Add the diced onion and sweat gently for a few minutes, then add the bacon and continue to cook till it colours slightly. Add the rice and stir for a few minutes to coat with fat. Pour in the glass of wine or Noilly Prat and stir while the wine bubbles and evaporates. Then add a ladleful of hot stock and keep stirring till the rice has absorbed almost all of it, before adding the next ladleful. Keep going like this until the stock is used up, the risotto looks creamy, and the rice is cooked, with the very slightest bite in the centre. If you run out of stock, you can finish off with hot water instead. When the risotto is almost ready, stir in the beans to heat through. Season to taste with salt and pepper, and add the remaining butter and the grated cheese. Remove from the heat and stir to combine. Serve at once. I love broad beans – our first crop is almost ready, so I’m definitely going to be making something like this. Thank you so much! I am very flattered 🙂 My poor little blog is a bit neglected these days, but I will get around to passing the award on!